Home › Uncategorized › Whole Hog Halloween 2! The leaves are falling, the mercury’s dropping, the wind is howling through the trees… and that can mean only one thing: Whole Hog Halloween rapidly approaches. We’re tearing the roof off the thing this year, and the big news in BBQ country is that Henry’s Rifle will take this opportunity to officially release his long-awaited full-length album, Barroom Weather! This record has been well over a year in the making, a fully DIY operation involving nearly everyone in our little enclave of rock’n’roll in the service of John’s spectacular collection of songs, so let’s just say that we fully intend to put the “party” in this album release party. Playing the album start-to-finish with a full band, you aren’t gonna wanna miss this Henry’s Rifle performance. Stayed tuned for more Barroom Weather news, coming at your ears and eyes all in due time. And of course, that’s not all! Closing out the festivities are the only band for the job, the four-headed dance party machine that is Rival Galaxies! In just over a year, these dudes have become one of our favorite bands in all the Capital Region, a thunderous sonic rush of ridiculously catchy songs, space-age synths, massive basslines and superhuman drumbeats. We expect to see all manner of ghosts and ghouls at Whole Hog Halloween, but your feet ain’t moving to this, you might actually be the walking dead. Wait, there’s more! Built4BBQ supergroup Kimono Dragons bring their spooky, destroy-all-monsters sci-fi surf-rock to the stage. Fuzz, reverb and a thunderous rhythm section collide into the soundtrack to a slasher movie that just happens to take place on surfboards in the Pacific Ocean. We know how much the Dragons enjoy Halloween, so it’s quite possible there’s a surprise or two up their collective kimono sleeve. Rounding out this mean, lean lineup is one of the finest rock ‘n’ roll groups the Albany area’s produced over the last couple years, B3nson Recording Company power trio Hammer Hawk! You know ’em and love ’em from their scene-stealing contribution to the Entree sampler, these dudes are knocking out the best straight-up, guitar-shredding, drum-flailing, no-nonsense rock music we’ve heard in these parts. Wrapping up mammoth melodies in a warm shell of delicious distortion, Hammer Hawk makes for a tasty, tasty appetizer to this four-course Whole Hog feast. It all goes down in the oldest, haunted-est bar in Albany, Pauly’s Hotel, where the beer still flows like it did during Prohibition. 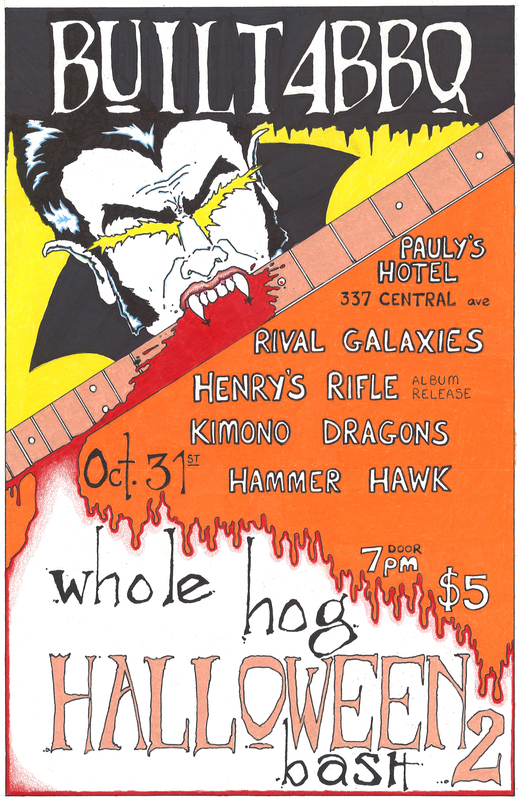 Start putting that perfect costume together, stock up on candy, and prepare to rock… Whole Hog Halloween is back, and this time, IT’S PERSONAL. ‹ Maggot Brain crushes the Low Beat.